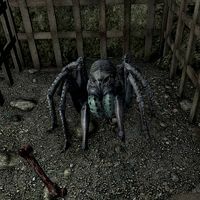 Arachnia is a trained frostbite spider trapped in a cage inside Cronvangr Cave. You can free it to make it your pet. Unlike normal frostbite spiders, it has a blue coloration. It cannot wear an Animal Collar or an Animal Pack. It is essential and will not engage in combat. Arachnia can be summoned using a teleportation spell. It can be instructed to follow you even if you already have another pet following you. You can instruct it to wait at a city, wait at its current location (either temporarily or permanently), wait at your house, or to carry items. It can also be instructed to "spin a web trap", which will cause Arachnia to place a large web on the ground. If an enemy runs over it, they will be briefly paralyzed and covered in web. Enemies immune to paralysis will not walk over the web trap. Additionally, there will sometimes be a dialogue option to harvest Frostbite Venom from it. The Vampire Naturalist's Journal contains background information on Arachnia. This page was last modified on 16 January 2019, at 21:29.